Born in 1927, Azizah began to learn to embroider when she was seven years old, in the 1930’s, when Bethlehem was famous as the center of Palestinian embroidery. The city was known for producing the embroidery for the famous malak dress, a wedding dress often worn by women of Jerusalem villages on their wedding day. Azizah learned to do the famous couching technique, using silk threads available in the marketplace. The embroidery was so prized that she earned more money than her husband. 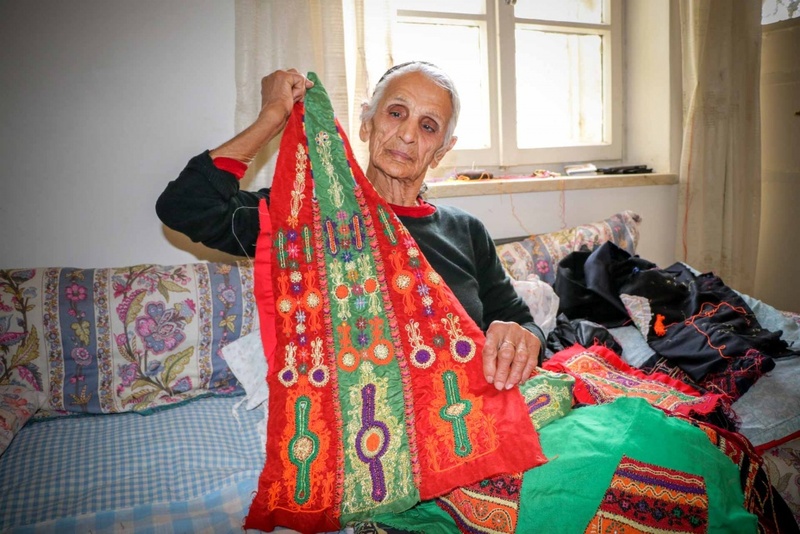 Though the famed malak dress largely disappeared in 1948, Azizah continues sewing wedding dresses from her home in Beit Sahour, the same work she has been doing for 83 years.